I stole this idea from another teacher who was co-teaching a special education strategies class. I come from a school that is hovering around 49% free and reduced lunch rate (aka a rough measurement for the poverty line). As a result, many of my students come to school without the necessary materials. To alleviate this stress, I decided to supply basic materials that we might need in class. Because we use interactive notebooks, we frequently need glue, scissors, and coloring utinsels. We also do a lot of highlighting in our notes. 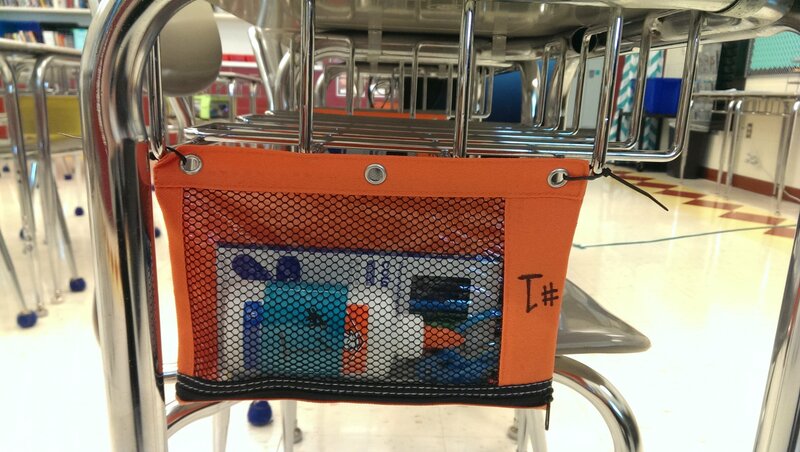 To make sure everyone had what they needed for class each day, I decided to attach pencil cases to the desks (about $24 for a pack of 24 on Amazon) using zip ties. Then, each item we would need frequently was taped and numbered to match its desk before being put in the pencil bag. Voila! Everyone has what they need to do the task at hand without ever having to leave their seat!